Shortly after September 11, J. Malcolm Garcia a self-described middle-aged, middle-of-the-road midwesterner arrived in Afghanistan. A former social worker, he had only recently become a reporter and had never covered a war. As for Afghanistan, he barely knew where it was. But during the next seven years of travel between Kansas City and a post-Taliban Afghanistan, Garcia found an emotional and professional center one that, in spite of other assignments and war reporting, drew him back to the region over and over again. Unlike flyby reporters traveling through the country armed with a sat phone and a ticket for the next flight to Islamabad, Garcia settled into Afghanistan learning its history, meeting its resilient people, occasionally making dreadful faux pas but ultimately forging lifelong connections. When he first arrived in the country, Garcia met Khalid, a young Afghan he affectionately called Bro, who became his driver, interpreter, and, eventually, his friend. Bro in turn called Garcia the khaarijee the outsider. He told Garcia he wasn’t responsible for his new friend’s life, but at least two times saved it. He instructed Garcia to avoid dogs because they were rabid, then helped him steal a puppy from an organized dog fight. Bro told him to be wary of street children, only to assist him in feeding and educating six homeless, war-orphaned boys. Bro was Sancho Panza to Garcia’s Don Quixote, and together they faced the consequences of war, life without the Taliban, and Afghanistan’s uncertain future. The Khaarijee tells this story of two strangers, one dog, and six orphans thrust together after 9/11 an intersection of paths that, by all rights, should never have crossed. 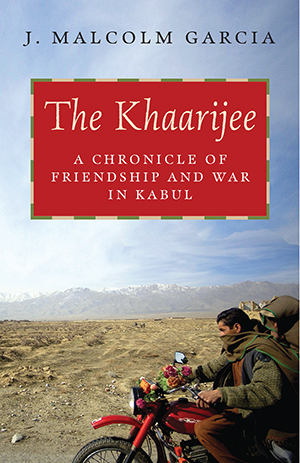 At a time when Afghanistan is on the brink, Garcia offers a gritty, raw, and unsentimental memoir about friendship, loss, and wanting to make a difference in the midst of a war-torn country, extending The Khaarijee beyond much travel writing and war reportage.